Note that . The solution of a tridiagonal matrix equation is, of course, a relatively trivial numerical exercise (Press, et al. 2007). The , , and values for the various harmonics of the forcing term in the Laplace tidal equations for the Earth are specified in Table 12.3. Note that, on the longitudinal meridian , the Moon and Sun culminate simultaneously at . Moreover, at this time, the Sun and Moon are both passing though the summer solstice, and the Moon is passing though its perigee. The mean density of the Earth is such that (Yoder 1995). Moreover, the mean depth of the Earth's oceans is (Yoder 1995), which implies that . Finally, the Earth responds elastically to the relatively low-amplitude lunar and solar tidal gravitational fields in such a manner that (Fitzpatrick 2012). Figure: Long-period solutions to the Laplace tidal equations (left panel) together with the corresponding equilibrium tides (right panel). The solid, dashed, and dash-dotted lines correspond to , , and , respectively. Here, is measured in meters. It can be seen from Figure 12.1 that the long-period solutions are direct (i.e., they have the same signs as the corresponding equilibrium tides). However, the amplitudes of these solutions are about times lower than those of the equilibrium tides. The ( ) and ( ) solutions cause a slight increase in the equatorial bulge of the Earth's oceans when the Sun and Moon, respectively, pass through the equinoxes, and a slight reduction when they pass through the solstices. The ( ) solution causes a slight increase in the equatorial bulge of the Earth's oceans when the Moon passes through its perigee, and a slight reduction when it passes through its apogee. Figure: Diurnal solutions to the Laplace tidal equations (left panel) together with the corresponding equilibrium tides (right panel). The solid, dashed, and dash-dotted lines correspond to , , and , respectively. Here, is measured in meters. 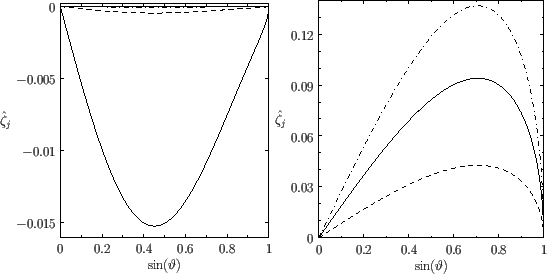 It can be seen from Figure 12.2 that the diurnal solutions are inverted (i.e., they have the opposite signs to the corresponding equilibrium tides). The amplitude of the solution is about times lower than that of the equilibrium tide. The amplitudes of the and solutions are negligibly small. (In fact, the amplitude of the solution is identically zero.) The ( ) solution causes the Earth's oceans to displace slightly toward the Moon when it passes through the equinoxes, and away from the Moon when it passes through the solstices. 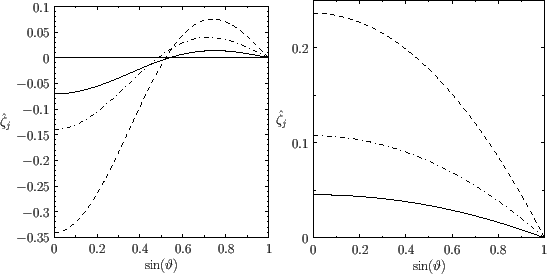 Figure: Semi-diurnal solutions to the Laplace tidal equations (left panel) together with the corresponding equilibrium tides (right panel). The solid, dashed, and dash-dotted lines correspond to , , and , respectively. Here, is measured in meters. Finally, it can be seen from Figure 12.3 that the semi-diurnal solutions are inverted in equatorial regions, and direct in polar regions. Moreover, the amplitudes of these solutions are similar to those of the corresponding equilibrium tides. The dominant ( ) solution generates a high tide at a particular point on the Earth's surface every hours. The ( ) solution causes an enhancement of the high tide--a so-called spring tide--at the new and full moons (i.e., every half a synodic month, or days). Finally, the ( ) solution causes an enhancement of the spring tide--a so-called perigean spring tide--whenever the new or full moon coincides with the passage of the moon through its perigee. The previously described global solutions to the Laplace tidal equations were first obtained (in simplified form) by Laplace (Lamb 1993). Let us consider how these solutions compare with the observed terrestrial tides. One obvious prediction of the global solutions is that the time variation in ocean depth at a given point on the Earth's surface should be expressible as a superposition of terms that oscillate at constant amplitude (but not necessarily in phase with one another) with the periods specified in Table 12.3. This is indeed found to be the case (Cartwright 1999). Another prediction is that the amplitudes of the long-period solutions should be small compared to the amplitudes of the semi-diurnal solutions. This is also found to be the case. Yet another prediction is that amplitudes of the diurnal solutions should be small compared to the amplitudes of the semi-diurnal solutions. This turns out not to be the case (Cartwright 1999). In fact, this predication is an artifact of the fact that we are assuming that the ocean covering the Earth's surface is of constant mean depth. If we relax this assumption, and allow the ocean depth to vary in a realistic manner, then the amplitudes of the semi-diurnal solutions become comparable to those of the diurnal solutions (Lamb 1993). The final prediction is that a given solution is such that the tide at a given point on the Earth either oscillates in phase or in anti-phase with the corresponding equilibrium solution (i.e., the tide is either direct or inverted). In particular, for the dominant tide, this implies that, at a given point on the Earth's surface, there should be either a tidal maximum or a tidal minimum whenever the Moon culminates. It turns out that this is not the case (Cartwright 1999). Indeed, the observed phase difference between the tide and the corresponding equilibrium tide varies from place to place on the Earth's surface, and can take any value. In other words, high tide at a given point on the Earth can occur three hours before the Moon culminates, or two hours after, et cetera, and the time lag between high tide and the culmination of the Moon varies from place to place. We conjecture that this effect is caused by the continents impeding the flow of tidal waves around the Earth. Hence, we now need to consider tides in oceans that do not cover the whole surface of the Earth.